Amazingly, it was published in the Washington Post. I have to confess, though, that I didn’t find it. I’m in the Cayman Islands for a conference and Jim Miller (Ronald Reagan’s second-term Budget Director and a great American) included it in his presentation. Needless to say, I swiped it from him so I could share with you. The FAIR TAX is the answer. Basically a flat consumption tax with certain credits to protect the poor in society. on April 22, 2012 at 2:04 am Sean L.
I agree with the FairTax being best — #1 No need to tell the government what I do for a living, how many kids I have, etc, etc. #2 Changes would be much more transparant than they are now. Certainly changes in the marginal rate would be immediately visible by the people. #3 Everyone would pay their fair share, so long as large-ticket items like houses are not excluded. The FairTax proposal is our only way out! A replacement for our oppressive income-based tax system, it relieves the low-income of federal taxes on essentials and allows the cash economy, tourists and non-citizens to pay taxes. Yes. It can take the road less traveled, the one of liberty. Almost 50 percent of the individuals in the U.S. pay no income tax at all and receive most of the financial benefits from the Federal Government sponsored programs. With no financial involvement in the country they are eager to vote for every politician that promises another free handout. If the group of non paying individuals continues to grow then those of us paying the bills will be stripped of our funds and be reduced to living on the Federal Government dole. With VAT each individual can decide what he or she will buy and what taxes they are willing to pay. One can not do this when the Federal Government directs what we must each pay. The VAT is only acceptable if all other Federal Taxes are terminated. Vat certainly has it’s problems, which you mention. The issue for the US is that all it’s main competitors use it to cut their business taxes, and so are more competitive at attracting job-creating industry. Mexico, Europe and China all have maturing vat systems. India is about to revise its system. So does the US have a long term choice? The comments are great. VAT, and with the Pelosi tax on financial transactions they could eventually tax every person of every dollar they every make. NO money due to taxes? No products bought. GM, Banks, Wall street out of business. No rich people to start businesses. Well enough silliness on my part. What a VAT would do is strengthen an underground cash, only economy. Many people are heading towards cash only businesses now days with no accounting for income or out go. It beats the tax issue since there is no way to account or for it to be tracked. Barter would come back in vogue and maybe even quality products would come back instead of the trash we get in the market now. VAT is an income tax. Who do you think Adds Value? It’s employees. on May 7, 2010 at 9:36 am Sean L.
The VAT itself isn’t any more or less destructive than personal income taxes. The main problem is many countries have adopted it IN ADDITION to existing income tax structures, which is what some people in our government are thinking right now. Another problem with the VAT is it creates a new requirement for manufacturers, distributors and retailers (the backbone of our economy) to report their activity to the government, which creates additional administrative burdens that will end up in the price tag of everything we buy. I believe (not speaking for Mr. Mitchell, but I imagine he would agree) a VAT on its own would actually be an overall improvement to the current unfair and complex tax structure we currently have here in the U.S. Better yet, a simple, end-use (sales) tax on goods would significantly reduce the administration burden of both companies and individuals. Either way, we MUST hold politician’s feet to the fire, and ensure they repeal the 16th amendment BEFORE enacting any consumption-related tax. 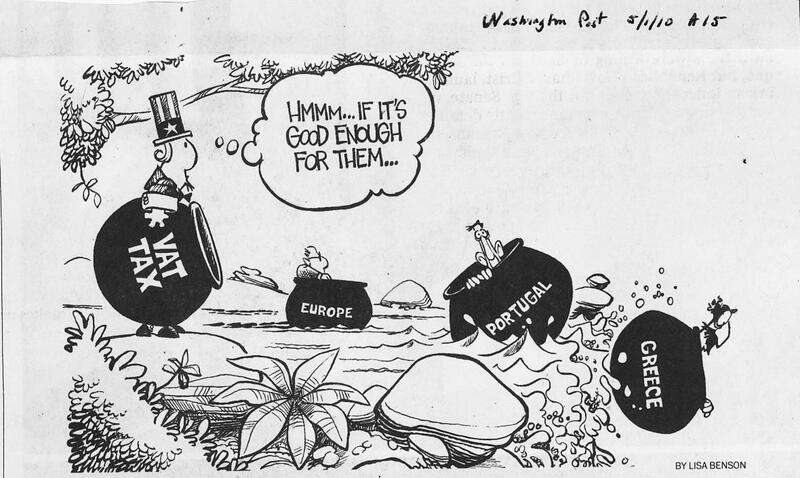 Yeah….the VAT tax is working so well over there in Europe……NOT! What do they have in common? Socialism…..they are all members of The Confederation of Socialist Parties. Obama is trying wilth all his might to change the United States into a Socialist country. Do you like your freedoms? Because that will be taken away also….you will be told what you can and cannot do, living like robots, controlled by the government. Why a VAT would be worse than other tax, like a personal income tax? Could you update your thoughts on it?